REPRESENTATIVE JOHN CONYERS, author of the single-payer bill HR676, was asked if he would come around in the end to voting for a version of President Obama’s health reform plan. He replied that he would, but only on two conditions. First, there would have to be a full discussion of single-payer reform in Congress. With Senator Max Baucus’ exclusion of single-payer advocates from hearings held by his Finance Committee, the chances of meeting this condition have dwindled. Conyers’ second condition was that the so-called public option in the Obama-style (i.e. “mixed private-and-public”) plan have teeth: In short, premiums for those entering the plan should reflect the savings made in administrative costs. The insurance industry — along with allies in the Chamber of Commerce, the drug industry and the American Medical Association —have invested a fortune to limit or eliminate the public option. Based on all this, Conyers will have to wait for another session of the Congress to vote for health care reform. More importantly, as Congress takes its summer recess the question put to Conyers is the same that many would-be supporters of his HR676 are putting to themselves. Many of these good folks start with the idea that they do not want to allow “the perfect to be the enemy of the good.” What they see in the Obama approach — if it survives the blockages and corporate-funded assaults in Congress, a dubious assumption — is that it will get health care for most of the 45 to 50 million in the United States who have no insurance. Think of the despair and suffering this will eliminate! Who knows when we shall have the opportunity for getting the perfect reform? Best to take a first step and make improvements as opportunity arises. It would indeed be unpardonable to let rigid views of perfection stand in the way of relieving massive social ills. “Mandating” the purchase of insurance is anathema to some conservatives since it violates their rigid view of individual freedom, but is also abhorrent to single-payer advocates since it will benefit for-profit insurers. Yet these criticisms by themselves shouldn’t lead to rejecting a quick fix for the problems of the uninsured. They become effective only in a broader context: in the current situation, promoting individual mandates and for-profit insurers can create a social disaster. The details aren’t easy to follow, and the insurance industry doesn’t particularly want you to understand them, but grit your teeth and give it a try. Conservatives are already using the projected high cost of government subsidies for insuring the uninsured as a reason for undoing any government support for health care, including Medicare. Rick Scott, of Hospital Corporation of America infamy, is funding Conservatives for Patients Rights, which uses the occasion of Obama’s reform as a chance to rant against Medicare as government-run health care. The estimate for costs comes from the Congressional Budget Office study of plans being developed by several House committees. Senate committees are also adopting these projections as the amount that needs to be offset by savings. According to the CBO, the subsidies for getting people insurance would add $1.042 trillion to the federal deficit between 2010 and 2019. The CBO’s assumption of 8% annual increases in health costs for the decade seems reasonable in the absence of a systematic way of controlling costs and premiums. But these projected annual increases in medical costs are several percentage points higher than any expected annual increases in income. Tax returns from income-based items will then lag farther and farther behind the deficit created by rising medical costs. The virtue of a single-payer system is that it attacks this socially disastrous rise in medical costs at its source. The single payer can negotiate medical costs — doctors’ fees, hospital rates, and drug and technology prices — with providers, effectively what countries with systems close to the single-payer model do. Market-oriented medical economists see only the denial of care as the solution. Two sources of savings would reduce this trillion dollar addition to the deficit to only $239 billion. One is a saving of $219 billion primarily from reining in Medicare costs over this period. Another is $533 billion from a proposed surtax on high-income tax payers. Savings from Medicare are to come from unspecified actions by both Congress and the President, who will have new authority in this area. It appears that Medicare savings would come from medical programs, since doctors are to get higher pay for Medicare services, at a cost of $250 billion each year. This measure facilitated AMA’s recent support for Obama-style reform. As to the surtax, couples would pay a surcharge on any income in excess of $350,000. This surtax, proposed by House Democrats, has not met with the favor of the powerful Finance Committee in the Senate. It appears then that there would be little prospect of savings that would offset the trillion-dollar addition to the deficit. Instead, the Finance Committee is proposing a tax on selling health insurance. A variant of this would be a less popular sales tax paid by buyers of health insurance. Because an Obama-type plan will add to the deficit, Obama himself has made an effort to get commitments from the big players in the health industry to slow the growth in health spending by 1.5% each year for ten years. The pharmaceutical companies agreed to save $80 billion and the hospitals agreed to save $150 billion. Bringing the industry to the White House, to enlist it in the common effort to make sure that reform would be affordable, ultimately won enough good will to get the endorsement of parts of the industry for an Obama-type plan. This has not stopped sections of the industry from insisting that their special interests be respected in whatever is passed. Those interests are having success in the Senate Finance Committee, where the public plan and the mandate that large employers pay for employees’ health care have been pushed off the table. Those industry leaders have also had an influence in the House, where a scruffy pack of “Blue Dog” Democrats got the House leadership to agree to giving low-income people subsidies only after they spend 12% of their own income — rather than 11% — on health care. They also got agreement to uncouple pay to providers in the public plan from Medicare rates, opening up the possibility of pay closer to that from private insurance. Daschle is describing a corporatist arrangement in which leaders in a major sector become part of governing in collaboration with the official administration. Any initiative that cannot be a basis for an agreement with the leaders of the industry becomes by definition “unrealistic” and automatically off the table. There are multiple ways that any reform will be at odds with the interests of the industry. Now that the industry “owns the process” of reform it will see to it that the reform serves its interests. Alongside the disaster of uncontrolled health care costs, we have here a social disaster that upends democracy in health care and replaces it with rule by the health industry and its allies. Concentrating on a short-term increase in the ranks of the insured hides these social disasters. Obama has not given ownership of the process to the health industry by accident. His main argument for the type of plan he would like to sign into law is that, unlike a single-payer plan, it would be “faithful to our legacy” of a system that includes a mixture of employer-based insurance plans administered by for-profit insurers and plans underwritten by those private insurers. With this “legacy” the insurance lobby, AMA bureaucrats and the drug lobby will be those whose interests the President and committee chairs must protect in resolving the long-standing crisis of our health care system. To alert the public to the “danger” of a public plan option, the Lewin Group claimed that 100 million people would switch to the public plan. Some background helps make clear that the estimate was intended to bolster the insurers’ case that a public plan would be unfair to them. Lewin, it turns out, is owned by Ingenix, which was recently fined for collaborating with insurers to defraud the public in setting out-of-network pricing. Moreover, both Lewin and Ingenix are partners with American Health Insurance Plans, the insurers’ major lobbying arm. Since at present there is no clear idea even of who would be eligible for the public plan, obviously there can be no reliable estimate of how many would opt for it. If there is to be a public plan, which the influential Senate Finance Committee has already rejected, it may not be open to employees in large firms. In the likely event that there will be no place for employees of large employers in the public plan, the number of enrollees in it would be a fraction of the Lewin estimate. But this would mean that employees of large employers would still be using whatever bargaining power they have on keeping decent health plans, rather than overcoming the long decline in the real value of their wages. Subsidies are the mechanism in the Obama-style plans for getting lower-income people insured, but there is no science telling us exactly how much people can afford to pay for health care on their own before a subsidy kicks in. So, legislators start by picking a number. They say that those seeking subsidies should all expect to pay on their own the same percentage of their income on health care. For the House it was 11% and for the Senate it was 12.5%. These numbers define what is deemed “affordable” for people. If the full premium for insurance is greater than what is affordable, the subsidy is the amount of the difference between the two. Increasing the percentage deemed affordable will reduce the national deficit — without actually enabling people to pay for insurance. Also, since eligibility for subsidies ceases at a certain income, reducing that income from, say, four to three times the poverty level can reduce the deficit incurred by subsidies — but only by increasing the number of those who, despite the mandate, cannot afford insurance. All this indicates that pursuing the Obama-style plan points in the direction of social disaster. With the industry in charge, it will not matter whether there is a public plan: The public plan will end up without the power to control health costs. There is no agreement on how to raise the trillion dollars the subsidies would cost. It cannot be raised from a surtax on the rich. It should not be raised by cutting Medicare services. But a program that is creating a deficit is too vulnerable to last. With its demise, there will be frustration and bitterness as people who lose insurance find that rising medical costs have made insurance even less affordable. The issue is not just whether single payer avoids these drawbacks of a subsidy system to pay insurers. It is also how to get rid of the corporatist arrangement set up by Obama to control the reform process. The first order of business, then, is a popular action demanding the removal of the industry’s leaders, and those in the Congress they have amply rewarded, from leadership of the process. This is a demand for a return to us of our democratic institutions. 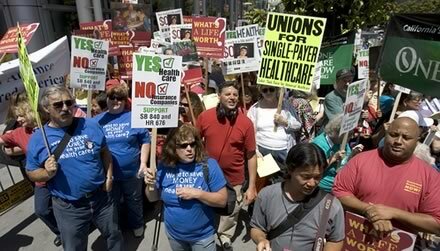 There is a growing public consensus around single payer, but what is still lacking is taking notice that, on this issue at least, Obama has set the public aside to install corporate control over health care reform. This article is the featured editorial in Against the Current issue 142.